In football Howard Baker, a Liverpudlian (he was born close to Anfield in 1892), started out as a centre-half playing for Marlborough Old Boys of Liverpool, Liverpool Balmoral and Northern Nomads. He was considered good enough to be selected for England amateur trials whilst playing for Blackburn Rovers. 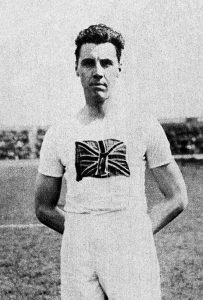 It was as a high jumper that Howard Baker (some reports call him Benjamin Howard-Baker and his original census listing at birth called him simply ‘Benjamin Howard’) first came to fame. His father took him to the Liverpool Harriers club in an effort to ‘tire him out and stop him jumping about’. It didn’t really work. 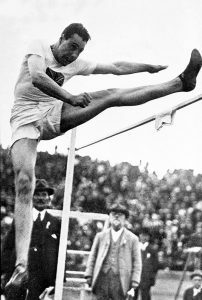 He won the AAA high jump title at Huddersfield in 1910 as an 18-year-old and would go on to capture the crown twice more before the 1st World War and three times after it. Alongside those six AAA titles, Howard Baker also won the Northern high jump title seven times. He was chosen to represent his country in the high jump at the 1912 Antwerp Olympics where he finished 11th, and the 1920 Stockholm games in the high jump (6th), triple jump (8th) and standing jump. His high jump of 6ft 5in at Huddersfield Cricket Ground in 1921 was a British record that stood for 21 years whilst he was also an excellent long-jumper. And even in the field of athletics, Howard Baker’s skills weren’t limited to jumping. He won the discus event at the 1920 Northern Counties Championship and the 120 yards hurdles at the same championships in 1921 and also competed in javelin and shot putt for his club. 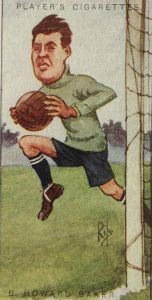 An ankle injury suffered when on mine-sweeping duty on a Q boat during his time in the Navy in WW1 forced a position change in football and he became a goalkeeper. But the change of role, rather than proving a setback, led to Howard Baker being even more successful. His previous experience as an outfield player gave Howard Baker the ability and confidence to come out of his area, a rarity among goalkeepers of the time and he also possessed a prodigious throw and kick enabling him to start his team’s attacks. Immediately after the war Howard Baker joined Preston North End before moving on to Liverpool. He was at Anfield only briefly, no doubt picking up some tips from the great Elisha Scott, and then after an excellent performance in a reserve derby match, joined Everton for whom he played two league matches, against Chelsea and Tottenham Hotspur. In both matches he won widespread praise and according to reports, was ‘heartily cheered’. Whilst making his mark with top flight clubs he continued his amateur career, leaving Northern Nomads (with whom he had won the Welsh Amateur Cup) to join the famous Corinthian F.C. It was while he was on Everton’s books, and also those of Corinthian, that Howard Baker received his first England call-up. The international debut came in May 1921 and was part of his country’s end-of-season tour. 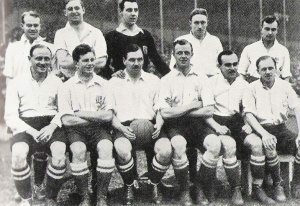 Playing Belgium in Brussels, he kept a clean sheet as goals from Charles Buchan and Harry Chambers guided England to a 2-0 win. In 1921 he left Liverpool for London, and joined Chelsea. He became the first-choice number one at Stamford Bridge making 92 appearances in five years and also proved very popular with the West London fans. In his first season with Chelsea the team were playing Bradford City at home and the game was scoreless. The Blues were awarded a penalty and Howard Baker, on his sixth start for the club insisted in taking it. He scored and it proved to be the only goal of the game. Later in the season the Blues were awarded a penalty against Arsenal and he again took on the responsibility. This time he missed and was thereafter relieved of spot-kick taking duties. In 1924 whilst turning out for his ‘other’ team Howard Baker participated in a shock. Corinthian were drawn against First Division Blackburn Rovers in the first round of the F.A. 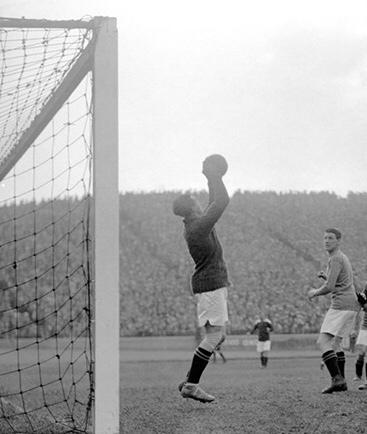 Cup and the tie was played at Crystal Palace in front of 20,000 fans. 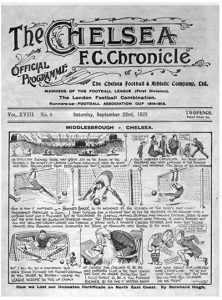 The goalkeeper, who had played for Chelsea in a 2nd Division match the previous weekend, lined up alongside two other current England internationals in Alfred Bower and Jackie Hagan, whilst former England star Norman Crook and Scottish cap John Morrison were also in the line-up. Howard Baker’s recall to the national team came in October 1925 when he was chosen, at the age of 33, to face Northern Ireland in Belfast. He maintained his record of not conceding at an international goal as the game finished goalless. Alongside those two caps for the England professional team (although he was an amateur) he also made 10 appearances for the Amateur side. 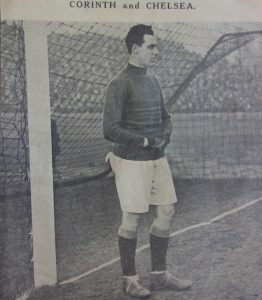 He made his last start for Chelsea in November 1925 before moving back up north when `everton were in the midst of a goalkeeping crisis to resume his career at Goodison. But Everton were struggling mightily at the time and despite some fine performances, including in a 1-0 win over Liverpool in front of 43,973 fans and even a spell as captain, he was eventually dropped in favour of Arthur Davies. A one-match spell at Oldham Athletic followed and he did get to make a farewell appearance at Goodison when keeping goal for Corinthians. Everton won the game 1-0 but according to reports the score line would have been much greater were it not for the ‘keeper’s brilliance. 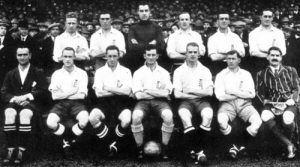 In October 1925 Howard Baker was chosen for the Amateur side that faced the Professionals in that year’s Charity Shield game at White Hart Lane. With four goals from fellow Corinthian Claude Ashton and two more from Army man Fusilier Frank Macey, the Amateurs won 6-1 with a performance described which led to them being called ‘As fine an Amateur side as we have seen for some seasons’. For his skill on the football pitch and athletics field alone Benjamin Howard Baker deserves recognition as a great all-round sportsman. But his abilities went way beyond these two sports. A more than accomplished tennis player he won the Welsh covered courts doubles title in 1932 (at 40 years old) and tried, albeit unsuccessfully, to qualify for Wimbledon on a couple of occasions. He was a member of the Lancashire district Water Polo team (perhaps unsurprisingly, as a goalkeeper) and was known for his abilities at ‘trick diving’. He also played cricket for the Lancashire Second XI. In business circles Howard Baker was also highly regarded, taking over his father’s wholesale drugs, cleaning and soap (the company manufactured ‘Aunt Sally’ one of the most popular deodorants of the day) concern and running it successfully whilst finding time to pursue his various sporting passions. It is difficult to know what to put first in Benjamin Howard Baker’s list of sporting achievements. And also impossible to predict just how good he might have been should he have devoted himself to sport full time rather than just as a pastime. 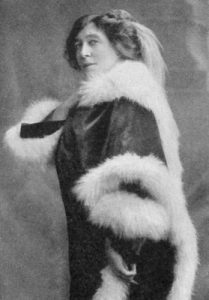 But, had he been a professional sportsman it’s likely that he would never have got the chance to impress the famous socialite Lily Langtry as he did at a social event in Paris by jumping to kick a chandelier. In 1973 he attended a Merseyside derby at the age of 81, still bemoaning the fact that he had been unable to perform the newly-popular ‘Fosbury Flop’ during his high jump career. By the time he passed away, aged 95 in 1987 at his home at Warminster in Wiltshire, Benjamin Howard Baker could truly be called the ‘Last of the Corinthians’.